Politics of Emerging World. 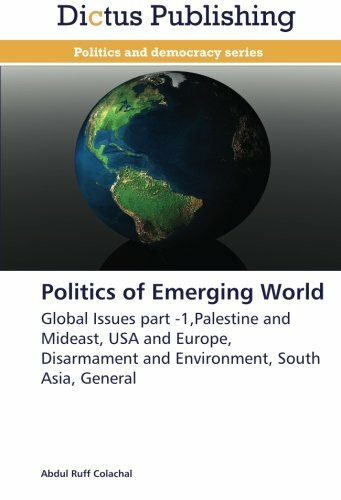 This book forms a part of series of books on global politics and it discusses the major issues s world is facing right now against background of NATO war in Islamic world, engage din genocides of Muslims and destabilizing of energy rich Muslims nations. All colonial nations led by USA-Israel twins have made the world horror struck. Millions have been killed in occupations especially in Palestine, Kashmir, Afghanistan, Iraq, Pakistan, Libya, Syria and elsewhere. This a collection of articles written recently by Dr. Abdul Ruff Colachal, a global columnist on international affairs and an eductor. BuySomeBooks is great place to get your books online. With over eight million titles available we're sure to have what you're looking for. Despite having a large selection of new books available for immediate shipment and excellent customer service, people still tell us they prefer us because of our prices. within 30 days of the estimated delivery date. If you've changed your mind about a book that you've ordered, please use the Ask bookseller a question link to contact us and we'll respond within 2 business days. Orders usually ship within 1-2 business days. Books are shipped from multiple locations so your order may arrive from Las Vegas,NV, Roseburg,OR, La Vergne,TN, Momence,IL, or Commerce,GA.